If rain is bringing water back to your home, it’s time to evaluate your gutters. 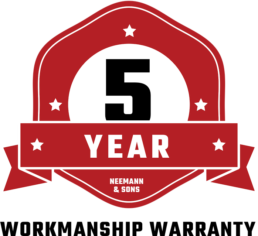 For more 38 years, Neemann & Sons have been proudly cleaning and installing gutters for homes throughout Nebraska. With our year-round service, you can depend on us to manage your gutter system with prompt, reliable and expert workmanship. Standard gutter systems are connected with multiple pieces to form a whole unit with are prone to leaks. With seamless gutters, homeowners enjoy a priceless finish without ever having to worry about leaks again. Neemann & Sons uses state of the art technology to create a single piece curved gutter that is designed for rainwater to slide through with ease. All seamless gutter systems are made from a premium aluminum material and custom fitted to your home. You can choose from an assortment of colors to match the style of your home while improving its overall value. A clogged gutter can lead to in-house flooding, structural damage to your home, and severe damage to your landscaping, windows, and doors. Stop a small problem from turning into potentially a bigger, more expensive problem and get your gutters cleaned today. No mess. No worries. At Neemann & Sons, we bag all the debris from your gutters and remove it from your property when we’re done, it’ll seem like we were never even there. Neemann & Sons have helped many families and homeowners touch up, upgrade, and redesign their homes. We strive to build a better community and offer only top quality products and the highest level of satisfaction. Check out some of the work we’ve provided for many satisfied residents in your community. Neemann & Sons did a great job on our new roof. They finished in one day! New gutters were also installed later and look great! They were helpful in working with my insurance company too. Neemann & Sons is a trusted, well run family business. You can depend on them to be there when they say they will be and to get the job done right. I will always recommend them to anyone needing their services. These guys are the best! We had a very difficult complex (in my opinion) roof that needed replaced. Neemann and Sons worked relentlessly to solve the problem. The guys were professional, courteous and respectful of our property. a complimentary quote for your upcoming project. Please use the contact form to provide us with your contact information, address, and any details about your project. For a quicker response, call us directly at (402) 423-4853. 3515 N 39th St. Cir. © 2019 Neemann & Sons. All Rights Reserved. Davinci roofing has opened so many clients mind to what they can do with their roofs.